Happy Wednesday! In last week's Wedding Wednesday post, I mentioned that I have a lot of web resources that I turn to for wedding inspiration. This week, I want to showcase my top 5 favorites for you (out of bookmarked list that is much longer). Whether you're planning a wedding, helping someone else plan, or simply love looking at beautiful photos - these sites are great troves of inspiration! At the top of so many bride-to-be's lists, this one certainly tops mine too! Based in Boston, SMP is my number one wedding inspiration stop. From engagement to wedding inspiration, SMP's showcase of classic and understated weddings inspires me every day! 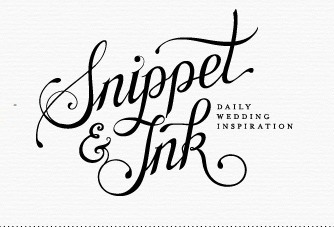 Number 2 on my daily wedding read list is Snippet & Ink - a favorite of mine from long before Josh every popped the question! Highlighting stunning and unique weddings and all of the moments leading up to the big day, this is a great resource for planning your wedding! My wedding shoes (and colors in general for that matter) are not going to be in the green color palette, but the inspiration that can be found here is endless! 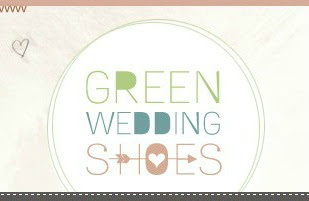 So many real weddings to explore and lots of DIY ideas to go along with them - Green Wedding Shoes infuses love to every one of their posts. Based on the West Coast, Love and Lavendar presents rustic and creative weddings that are helping me cultivate the personality Josh and I want to bring through in our wedding. With a new post up everyday, this constantly updated site is helping me every step of the way. Oh lovely day? Oh lovely inspiration! With a focus on breathtaking weddings, and the details that pull it all together, this is an amazing source of inspiration. The site also highlights planning tips - always a great help to read those tips along with seeing the creativity in the beautiful images! Do you have a favorite wesbite for wedding inspiration? Are any of these in your top 5? Some other notable mentions include: Wedding Obsession, Grey Likes Weddings and OnceWed. If you have any other great sites to suggest, I'd love to learn about them! Today, I'm linking up with Little Bit of Class Little Bit of Sass, Chits and Giggles, The Better Belle Project, and Belle in Boots! *Note: All images taken from screen shots of the website. Have you also looked at Wedding Gawker? They aren't quite a styled but they are real life wedding that are awesome! I have - and I don't love it as much! :( It seems a lot like Pinterest to me but I find Pinterest easier to work with and navigate. When it comes to real weddings, I think it's gotten easier to tell which are real and which are just styled shoots - the real weddings have so much more warmth and of course, are typically my favorites! Thanks for posting! I've been looking for inspiration other then Pinterest, TheKnot.com, and Style Me Pretty! Hey there! I wanted to let you know you were the winner of the bag giveaway last week on my blog! Can you email me your address so I can pass it along to the company? I love all of these blogs! Thanks so much for linking up! Style Me Pretty was my goal when I started planning. I really really wanted my wedding to be featured on there but then I realized that it probably wasn't going to happen. Oh well! It's still nice to look at their weddings. They are all so gorgeous! Well I know what I'm doing the rest of the day - checking out these sites! Thank you for this list and especially for linking up!